2006-11-20 Application filed by Pfizer Products Inc. filed Critical Pfizer Products Inc. This invention is directed to compounds of the formula I as defined herein, or a pharmaceutically acceptable salt thereof; a pharmaceutical composition containing a compound of formula I, a method of treatment of a disorder or condition that may be treated by antagonizing histamine H3 receptors, the method comprising administering to a mammal in need of such treatment a compound of formula I as described above, and a method of treatment of a disorder or condition selected from the group consisting of depression, mood disorders, schizophrenia, anxiety disorders, Alzheimer's disease, attention-deficit disorder (ADD), attention-deficit hyperactivity disorder (ADHD), psychotic disorders, sleep disorders, obesity, dizziness, epilepsy, motion sickness, respiratory diseases, allergy, allergy-induced airway responses, allergic rhinitis, nasal congestion, allergic congestion, congestion, hypotension, cardiovascular disease, diseases of the Gl tract, hyper and hypo motility and acidic secretion of the gastro-intestinal tract, the method comprising administering to a mammal in need of such treatment a compound of formula I as described above. This invention is directed to compounds of formula I described herein, to a pharmaceutical composition comprising such compounds, and to methods of treatment of disorders or conditions that may be treated by antagonizing histamine-3 (H3) receptors using such compounds. 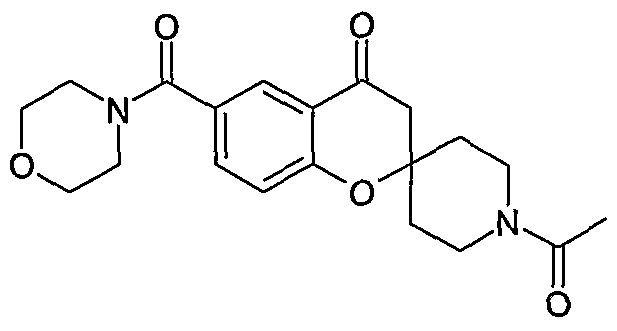 The histamine-3 (H3) receptor antagonists of the invention are useful for treating anxiety disorders, including, for example, generalized anxiety disorder, panic disorder, PTSD, and social anxiety disorder; mood adjustment disorders, including depressed mood, mixed anxiety and depressed mood, disturbance of conduct, and mixed disturbance of conduct and depressed mood; age-associated learning and mental disorders, including Alzheimer's disease; attention adjustment disorders, such as attention-deficit disorders, or other cognitive disorders due to general medical conditions; attention-deficit hyperactivity disorder; psychotic disorders including schizoaffective disorders and schizophrenia; sleep disorders, including narcolepsy and enuresis; obesity; dizziness, epilepsy, and motion sickness. The H3 receptor antagonists of the invention are also useful for treating, for example, allergy, allergy-induced airway (e.g., upper airway) responses, congestion (e.g., nasal congestion), hypotension, cardiovascular disease, diseases of the Gl tract, hyper- and hypo-motility and acidic secretion of the gastrointestinal tract, sleeping disorders (e.g., hypersomnia, somnolence, and narcolepsy), attention deficit hyperactivity disorder ADHD), hypo- and hyper-activity of the central nervous system (for example, agitation and depression), and other CNS disorders (such as schizophrenia and migraine). Histamine is a well-known mediator in hypersensitive reactions (e.g. allergies, hay fever, and asthma) that are commonly treated with antagonists of histamine or "antihistamines." It has also been established that histamine receptors exist in at least two distinct types, referred to as H1 and H2 receptors. A third histamine receptor (H3 receptor) is believed to play a role in neurotransmission in the central nervous system, where the H3 receptor is thought to be disposed presynaptically on histaminergic nerve endings (Nature, 302, S32- 837 (1983)). The existence of the H3 receptor has been confirmed by the development of selective H3 receptor agonists and antagonists (Nature, 327, 117-123 (1987)) and has subsequently been shown to regulate the release of the neurotransmitters in both the central nervous system and peripheral organs, particularly the lungs, cardiovascular system and gastrointestinal tract. A number of diseases or conditions may be treated with histamine-3 receptor ligands wherein the H3 ligand may be an antagonist, agonist or partial agonist, see: (Imamura et al., Circulation Res., (1996) 78, 475-481 ); (Imamura et al., Circ. Res., (1996) 78, 863-869); (Lin et al., Brain Res. (1990) 523, 325-330); (Monti et al., Neuropsvchopharmacoloqy (1996) 15, 31- 35); (Sakai et al., Life Sci. (1991) 48, 2397-2404); (Mazurkiewiez-Kwilecki and Nsonwah, Can. J. Physiol. Pharmacol. (1989) 67, 75-78); (Panula, P. et al., Neuroscience (1998) 44, 465-481); (Wada et al., Trends in Neuroscience (1991) 14.415); (Monti et al., Eur. J. Pharmacol. (1991) 205, 283); (Haas et al., Behav. Brain Res. (1995) 66, 41-44); (De Almeida and Izquierdo, Arch. Int. Pharmacodyn. 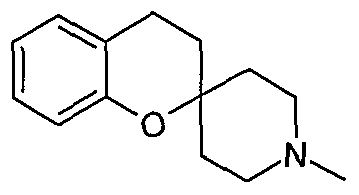 (1986) 283, 193-198); (Kamei et al., Psvchopharmacoloαv (1990) 102, 312-318); (Kamei and Sakata, Japan. J. Pharmacol. (199 1) 57, 437-482); (Schwartz et al., Psvchopharmacology; The Fourth Generation of Progress, Bloom and Kupfer (eds. ), Raven Press, New York, (1995) 3, 97); (Shaywitz et al., Psvchopharmacoloqy (1984) 82, 73-77); (Dumery and Blozovski, Exp. Brain Res. 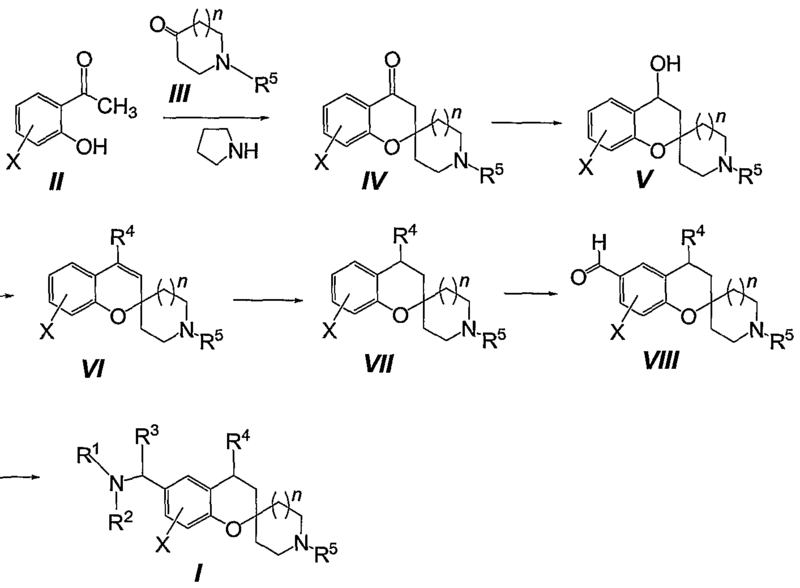 (1987) 67, 61-69); (Tedford et al., J. Pharmacol. Exp. Ther. (1995) 275, 598-604); (Tedford et al., Soc. Neurosci. Abstr. (1996) 22, 22); (Yokoyama et al., Eur. J. Pharmacol. (1993) 234, 129); (Yokoyama and linuma, CNS Drugs (1996) 5, 321); (Onodera et al., Prog. Neurobiol. (1994) 42, 685); (Leurs and Timmerman, Prog. Drug Res. (1992) 39,127); (The Histamine H3 Receptor, Leurs and Timmerman (ed. ), Elsevier Science, Amsterdam, The Netherlands (1998); (Leurs et al., Trends in Pharm. Sci. (1998) 19, 177-183); (Phillips et al., Annual Reports in Medicinal Chemistry (1998) 33, 31-40); (Matsubara et al., Eur. J. Pharmacol. 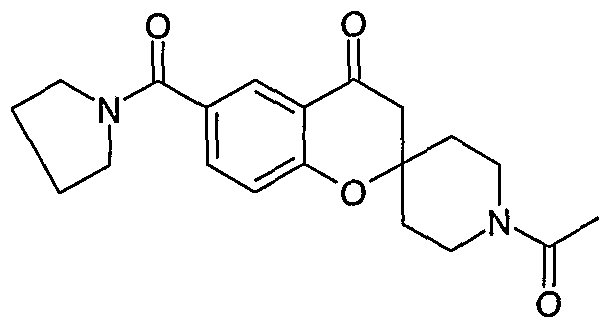 (1992) 224, 145); (Rouleau et al., J. Pharmacol. Exp. Ther. (1997) 28J, 1085); (Adam Szelag, "Role of histamine H3-receptors in the proliferation of neoplastic cells in vitro", Med. Sci. Monit.. 4(5): 747- 755, (1998)); (Fitzsimons, C, H. Duran, F. Labombarda, B. Molinari and E. Rivera, "Histamine receptors signalling in epidermal tumor cell lines with H-ras, gene alterations", Inflammation Res.. 47 (Suppl. 1): S50-S51 , (1998)); (R. Leurs, R.C. Vollinga and H. Timmerman, "The medicinal chemistry and therapeutic potentials of ligand of the histamine H3 receptor", Progress in Drug Research 45: 170-165, (1995)); (R. Levi and N.C.E. Smith, "Histamine H3-receptors: A new frontier in myocardial ischemia", J. Pharm. Exp. Ther., 292: 825-830, (2000)); (Hatta, E., K Yasuda and R. Levi, "Activation of histamine H3 receptors inhibits carrier-mediated norepinephrine release in a human model of protracted myocardial ischemia", J. Pharm. Exp. Ther.. 283: 494-500, (1997); (H. Yokoyama and K. linuma, "Histamine and Seizures: Implications for the treatment of epilepsy", CNS Drugs, 5(5); 321- 330, (1995)); (K. Hurukami, H. Yokoyama, K. Onodera, K. linuma and T. Watanabe, AQ-O 145, "A newly developed histamine H3 antagonist, decreased seizure susceptibility of electrically induced convulsions in mice", Meth. Find. Exp. Clin. Pharmacol.. 17(C): 70-73, (1995); (Delaunois A., Gustin P., Garbarg M., and Ansay M., "Modulation of acetylcholine, capsaicin and substance P effects by histamine H3 receptors in isolated perfused rabbit lungs". European Journal of Pharmacology 277(2-3):243-50, (1995)); and (Dimitriadou, et al., "Functional relationship between mast cells and C- sensitive nerve fibres evidenced by histamine H3-receptor modulation in rat lung and spleen", Clinical Science 87(2): 151 -63. (1994). Such diseases or conditions include cardiovascular disorders such as acute myocardial infarction; memory processes, dementia and cognition disorders such as Alzheimer's disease and attention deficit hyperactivity disorder; neurological disorders such as Parkinson's disease, schizophrenia, depression, epilepsy, and seizures or convulsions; cancer such as cutaneous carcinoma," medullary thyroid carcinoma and melanoma; respiratory disorders such as asthma; sleep disorders such as narcolepsy; vestibular dysfunction such as Meniere's disease; gastrointestinal disorders, inflammation, migraine, motion sickness, obesity, pain, and septic shock. H3 receptor antagonists have also been previously described in, for example, WO 03/050099, WO 02/0769252, and WO 02/12224. The histamine H3 receptor (H3R) regulates the release of histamine and other neurotransmitters, including serotonin and acetylcholine. H3R is relatively neuron specific and inhibits the release of certain monoamines such as histamine. Selective antagonism of H3R raises brain histamine levels and inhibits such activities as food consumption while minimizing non-specific peripheral consequences. Antagonists of the receptor increase synthesis and release of cerebral histamine and other monoamines. By this mechanism, they induce a prolonged wakefulness, improved cognitive function, reduction in food intake and normalization of vestibular reflexes. Accordingly, the receptor is an important target for new therapeutics in Alzheimer's disease, mood and attention adjustments, including attention deficit hyperactive disorder (ADHD), cognitive deficiencies, obesity, dizziness, schizophrenia, epilepsy, sleeping disorders, narcolepsy and motion sickness, and various forms of anxiety. 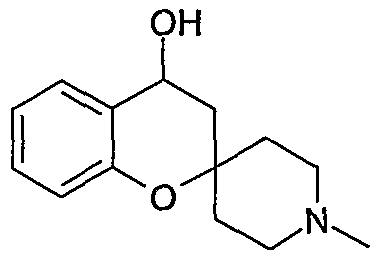 The majority of histamine H3 receptor antagonists to date resemble histamine in possessing an imidazole ring that may be substituted, as described, for example, in WO 96/38142. 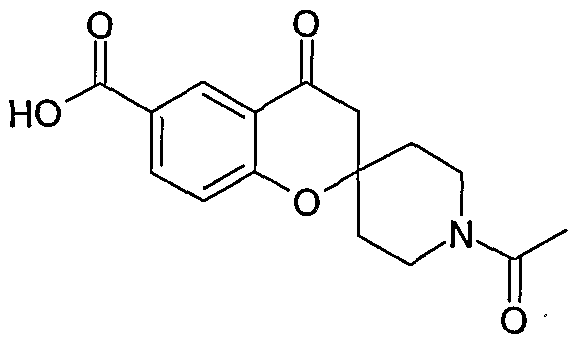 Non-imidazole neuroactive compounds such as beta histamines (Arrang, Eur. J. Pharm. 1985, 111:72-84) demonstrated some histamine H3 receptor activity but with poor potency. EP 978512 and EP 982300 disclose non-imidazole alkyamines as histamine H3 receptor antagonists. WO 02/12224 (Ortho McNeil Pharmaceuticals) describes non- imidazole bicyclic derivatives as histamine H3 receptor ligands, and EP 1275647 (Les Laboratoires Servier) has disclosed novel octahydro-2H-pyrido[1 ,2-a]pyrazines that are selective H3 receptor antagonists. Other receptor antagonists have been described in WO 02/32893 and WO 02/06233. The prior art also includes WO-96/39140 (Merck & Co.), which discloses novel spiro- piperidine chromans and their use as alpha-1a adrenergic receptor antagonists to treat benign prostatic hyperplasia (BHP). The present invention is directed to histamine-3 (H3) receptor antagonists useful for treating the conditions listed in the preceding paragraphs. The compounds of this invention are highly selective for the H3 receptor (vs. other histamine receptors), and possess remarkable drug disposition properties (pharmacokinetics). In particular, the compounds of this invention selectively distinguish H3R from the other receptor subtypes HiR, H2R. In view of the increased level of interest in histamine H3 receptor agonists, inverse agonists and antagonists in the art, novel compounds that interact with the histamine H3 receptor would be a highly desirable contribution to the art. The present invention provides such a contribution to the art being based on the finding that a novel class of spirocyclic amine compounds exhibits a high and specific affinity to the histamine H3 receptor. (optionally substituted), (C0-C3)alkyl-heteroaryl (optionally substituted); and n is 0, 1 , 2 or 3. Where cis and trans isomers are possible for an embodiment of the inventive compound of formula I, both cis and trans isomers are to be included within the scope of the invention. The term "alkyl" refers to straight or branched chains of carbon atoms. Exemplary alkyl groups are C1-C6 alkyl groups which include methyl, ethyl, propyl, isopropyl, butyl, isobutyl, pentyl, isopentyl, hexyl, and the like, including all regioisomeric forms thereof, and straight and branched chain forms thereof. The term "alkyl" is also used to denote straight or branched chains of carbon atoms having one or more carbon-carbon double bonds, such as vinyl, allyl, butenyl, and the like, as well as straight or branched chains of carbon atoms having one or more carbon-carbon triple bonds, such as ethynyl, propargyl, butynyl, and the like. The term "aryl" denotes a cyclic, aromatic hydrocarbon. Examples of aryl groups include phenyl, naphthyl, anthracenyl, phenanthrenyl, and the like. The terms "alkoxy" and "aryloxy" denote "O-alkyl" and "O-aryl", respectively. The term "cycloalkyl" denotes a cyclic group of carbon atoms, where the ring formed by the carbon atoms may be saturated or may comprise one or more carbon-carbon double bonds in the ring. Examples of cycloalkyl groups include cyclopropyl, cyclobutyl, cyclopentyl, cyclohexyl, cycloheptyl, and the like, as well as cyclopentenyi, cyclopentadienyl, cyclohexenyl, cyclohexadienyl, and the like. As used herein, the term "cycloalkyl" is also intended to denote a cyclic group comprising at least two fused rings, such as adamantanyl, decahydronaphthalinyl, norbornanyl, where the cyclic group may also have one or more carbon-carbon double bonds in one or both rings, such as in bicyclo[4.3.0]nona-3,6(1)-dienyl, dicyclopentadienyl, 1 ,2,3,4-tetrahydronaphthalinyl (tetralinyl), indenyl, and the like. The term "halogen" represents chloro, fluoro, bromo, and iodo. The term "heteroaryl" denotes a monocyclic or bicyclic aromatic group wherein one or more carbon atoms are replaced with heteroatoms selected from the group consisting of nitrogen, oxygen, and sulfur. If the heteroaryl group contains more than one heteroatom, the heteroatoms may be the same or different. Preferred heteroaryl groups are five- to fourteen- member rings that contain from one to three heteroatoms independently selected from oxygen, nitrogen, and sulfur. Examples of preferred heteroaryl groups include benzo[b]thienyl, chromenyl, furyl, imidazolyl, indazolyl, indolizinyl, indolyl, isobenzofuranyl, isoindolyl, isoquinolyl, isothiazolyl, isoxazolyl, naphthyridinyl, oxadiazolyl, oxazinyl, oxazolyl, phthalazinyl, pteridinyl, purinyl, pyranyl, pyrazinyl, pyrazolyl, pyridazinyl, pyridyl, pyrimidyl, pyrrolyl, quinolizinyl, quinolyl, quinoxalinyl, thiazolyl, thienyl, triazinyl, triazolyl, and xanthenyl. The term "heterocycloalkyl" denotes a cycloalkyl system, wherein "cycloalkyl" is defined above, in which one or more of the ring carbon atoms are replaced with a heteroatom selected from the group consisting of nitrogen, oxygen, and sulfur. Examples of such heterocycloalkyl groups include azabicycloheptanyl, azetidinyl, benzazepinyl, 1 ,3- dihydroisoindolyl, indolinyl, tetrahydrofuryl, tetrahydroquinolinyl, tetrahydroisoquinolinyl, morpholinyl, piperazinyl, piperidyl, pyrrolidinyl, and, tetrahydro-2H-1 ,4-thiazinyl. A cyclic group may be bonded to another group in more than one way. If no particular bonding arrangement is specified, then all possible arrangements are intended. For example, the term "pyridyl" includes 2-, 3-, or 4-pyridyl, and the term "thienyl" includes 2- or 3-thienyl. The term "C0-C4" includes the embodiment where there are no carbons in a chain. Thus, for example, the groups "C3-C7 cycloalkyl-C0-C4 alkyl," "C6-C14 aryl-C0-C4 alkyl," "5-10- membered heteroaryl-C0-C4 alkyl," and "C6-Ci4 aryl-C0-C4 alkylene-O-C0-C4 alkyl" include C3- C7 cycloalkyl, C6-C14 aryl, 5-10-membered heteroaryl, and C6-C14 aryl- 0-C0-C4 alkyl, respectively. The term "C1-C4 dialkylamino" refers to a dialkylamino group in which each alkyl- group is independently a C1-C4 alkyl group. This invention is also directed to: a pharmaceutical composition for treating, for example, a disorder or condition that may be treated by antagonizing histamine-3 receptors, the composition comprising a compound of formula I as described above, and optionally a pharmaceutically acceptable carrier; a method of treatment of a disorder or condition that may be treated by antagonizing histamine-3 receptors, the method comprising administering to a mammal in need of such treatment a compound of formula I as described above; and a pharmaceutical composition for treating, for example, a disorder or condition selected from the group consisting of depression, mood disorders, schizophrenia, anxiety disorders, Alzheimer's disease, attention deficit disorder (ADD), attention deficit hyperactivity disorder (ADHD), psychotic disorders, sleep disorders, obesity, dizziness, epilepsy, motion sickness, respiratory diseases, allergy, allergy-induced airway responses, allergic rhinitis, nasal congestion, allergic congestion, congestion, hypotension, cardiovascular disease, diseases of the Gl tract, hyper and hypo motility and acidic secretion of the gastrointestinal tract, the composition comprising a compound of formula I as described above, and optionally a pharmaceutically acceptable carrier. This invention is also directed to a method of treatment of a disorder or condition selected from the group consisting of the disorders or conditions listed in the preceding paragraph, the method comprising administering to a mammal in need of such treatment a compound of formula I as described above. The histamine-3 (H3) receptor antagonists of the invention are useful for treating, in particular, ADD, ADHD, obesity, anxiety disorders and respiratory diseases. Respiratory diseases that may be treated by the present invention include adult respiratory distress syndrome, acute respiratory distress syndrome, bronchitis, chronic bronchitis, chronic obstructive pulmonary disease, cystic fibrosis, asthma, emphysema, rhinitis and chronic sinusitis. The pharmaceutical composition and method of this invention may also be used for preventing a relapse in a disorder or condition described in the previous paragraphs. Preventing such relapse is accomplished by administering to a mammal in need of such prevention a compound of formula I as described above. 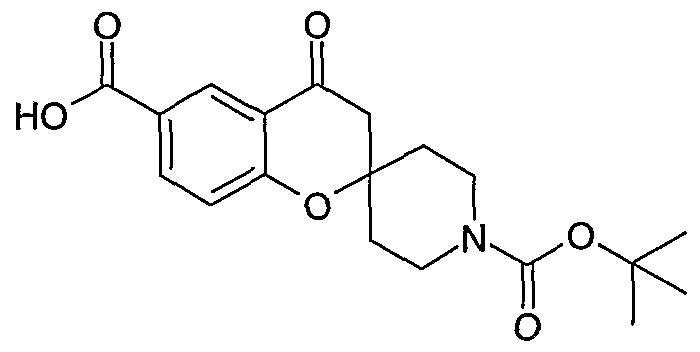 The disclosed compounds may also be used as part of a combination therapy, including their administration as separate entities or combined in a single delivery system, which employs an effective dose of a histamine H3 antagonist compound of general formula I and an effective dose of a histamine H1 antagonist, such as cetirizine (Zyrtec™), for the treatment of allergic rhinitis, nasal congestion and allergic congestion. The disclosed compounds may also be used as part of a combination therapy, including their administration as separate entities or combined in a single delivery system, which employs an effective dose of a histamine H3 antagonist compound of general formula I and an effective dose of a neurotransmitter reuptake blocker. Examples of neurotransmitter reuptake blockers will include the serotonin-selective reuptake inhibitors (SSRI's) like sertraline (Zoloft™), fluoxetine (Prozac™), and paroxetine (Paxil™), or non-selective serotonin, dopamine or norepinephrine reuptake inhibitors for treating depression and mood disorders. The compounds of the present invention may have optical centers and therefore may occur in different enantiomeric configurations. Formula I, as depicted above, includes all enantiomers, diastereomers, and other stereoisomers of the compounds depicted in structural formula I, as well as racemic and other mixtures thereof. Individual isomers can be obtained by known methods, such as optical resolution, optically selective reaction, or chromatographic separation in the preparation of the final product or its intermediate. The present invention also includes isotopically labeled compounds, which are identical to those recited in formula I, but for the fact that one or more atoms are replaced by an atom having an atomic mass or mass number different from the atomic mass or mass number usually found in nature. Examples of isotopes that can be incorporated into compounds of the present invention include isotopes of hydrogen, carbon, nitrogen, oxygen, phosphorous, sulfur, fluorine and chlorine, such as 2H, 3H, 13C, 11C, 14C, 15N, 180, 17O, 31P, 32P, 35S, 18F, and 36CI, respectively. Compounds of the present invention, prodrugs thereof, and pharmaceutically acceptable salts of said compounds or of said prodrugs which contain the aforementioned isotopes and/or other isotopes of other atoms are within the scope of this invention. Certain isotopically labeled compounds of the present invention, for example those into which radioactive isotopes such as 3H and 14C are incorporated, are useful in drug and/or substrate tissue distribution assays. Tritiated, i.e., 3H, and carbon-14, i.e., 14C, isotopes are particularly preferred for their ease of preparation and detectability. Further, substitution with heavier isotopes such as deuterium, i.e., 2H, can afford certain therapeutic advantages resulting from greater metabolic stability, for example increased in vivo half-life or reduced dosage requirements and, hence, may be preferred in some circumstances. Isotopically labeled compounds of formula I of this invention and prodrugs thereof can generally be prepared by carrying out the procedures disclosed in the Schemes and/or in the Examples and Preparations below, by substituting a readily available isotopically labeled reagent for a non-isotopically labeled reagent. "Antagonizing histamine-3 (H3) receptors," as used herein, refers to acting as a histamine-3 receptor antagonist. A "unit dosage form" as used herein is any form that contains a unit dose of the compound of formula I. A unit dosage form may be, for example, in the form of a tablet or a capsule. The unit dosage form may also be in liquid form, such as a solution or suspension. The compositions of the present invention may be formulated in a conventional manner using one or more pharmaceutically acceptable carriers. Thus, the active compounds of the invention may be formulated for oral, buccal, intranasal, parenteral (e.g., intravenous, intramuscular or subcutaneous) or rectal administration or in a form suitable for administration by inhalation or insufflation. For oral administration, the pharmaceutical compositions may take the form of, for example, tablets or capsules prepared by conventional means with pharmaceutically acceptable excipients such as binding agents (e.g., pre-gelatinized maize starch, polyvinylpyrrolidone or hydroxypropyl methylcellulose); fillers (e.g., lactose, microcrystalline cellulose or calcium phosphate); lubricants (e.g., magnesium stearate, talc or silica); disintegrants (e.g., potato starch or sodium starch glycolate); or wetting agents (e.g., sodium lauryl sulfate). The tablets may be coated by methods well known in the art. Liquid preparations for oral administration may take the form of, for example, solutions, syrups or suspensions, or they may be presented as a dry product for constitution with water or other suitable vehicle before use. Such liquid preparations may be prepared by conventional means with pharmaceutically acceptable additives such as suspending agents (e.g., sorbitol syrup, methyl cellulose or hydrogenated edible fats); emulsifying agents (e.g., lecithin or acacia); non-aqueous vehicles (e.g., almond oil, oily esters or ethyl alcohol); and preservatives (e.g., methyl or propyl p-hydroxybenzoates or sorbic acid). For buccal administration, the composition may take the form of tablets or lozenges formulated in conventional manner. The active compounds of the invention may be formulated for parenteral administration by injection, including using conventional catheterization techniques or infusion. Formulations for injection may be presented in unit dosage form, e.g., in ampoules or in multi-dose containers, with an added preservative. The compositions may take such forms as suspensions, solutions or emulsions in oily or aqueous vehicles, and may contain formulating agents such as suspending, stabilizing and/or dispersing agents. Alternatively, the active ingredient may be in powder form for reconstitution with a suitable vehicle, e.g., sterile pyrogen-free water, before use. The active compounds of the invention may also be formulated in rectal compositions such as suppositories or retention enemas, e.g., containing conventional suppository bases such as cocoa butter or other glycerides. For intranasal administration or administration by inhalation, the active compounds of the invention are conveniently delivered in the form of a solution or suspension from a pump spray container that is squeezed or pumped by the patient or as an aerosol spray presentation from a pressurized container or a nebulizer, with the use of a suitable propellant, e.g., dichlorodifluoromethane, trichlorofluoromethane, dichlorotetrafluoroethane, carbon dioxide or other suitable gas. In the case of a pressurized aerosol, the dosage unit may be determined by providing a valve to deliver a metered amount. The pressurized container or nebulizer may contain a solution or suspension of the active compound. Capsules and cartridges (made, for example, from gelatin) for use in an inhaler or insufflator may be formulated containing a powder mix of a compound of the invention and a suitable powder base such as lactose or starch. A proposed dose of the active compounds of the invention for oral, parenteral or buccal administration to the average adult human for the treatment of the conditions referred to above (e.g., depression) is 0.1 to 200 mg of the active ingredient per unit dose which could be administered, for example, 1 to 4 times per day. Aerosol formulations for treatment of the conditions referred to above (e.g., attention deficit hyperactivity disorder) in the average human are preferably arranged so that each metered dose or "puff" of aerosol contains 20 μg to 1000 μg of the compound of the invention. The overall daily dose with an aerosol will be within the range 100 μg to 100 mg. Administration may be several times daily, for example 2, 3, 4 or 8 times, giving for example, 1 , 2 or 3 doses each time. In connection with the use of an active compound of this invention with a histamine H1 antagonist, preferably cetirizine, for the treatment of subjects possessing any of the above conditions, it is to be noted that these compounds may be administered either alone or in combination with pharmaceutically acceptable carriers by either of the routes previously indicated, and that such administration can be carried out in both single and multiple dosages. More particularly, the active combination can be administered in a wide variety of different dosage forms, i.e., they may be combined with various pharmaceutically acceptable inert carriers in the form of tablets, capsules, lozenges, troches, hard candies, powders, sprays, aqueous suspension, injectable solutions, elixirs, syrups, and the like. Such carriers include solid diluents or fillers, sterile aqueous media and various non-toxic organic solvents, etc. Moreover, such oral pharmaceutical formulations can be suitably sweetened and/or flavored by means of various agents of the type commonly employed for such purposes. In general, the compounds of formula I are present in such dosage forms at concentration levels ranging from about 0.5% to about 95% by weight of the total composition, i.e., in amounts which are sufficient to provide the desired unit dosage and a histamine H1 antagonist, preferably cetirizine, is present in such dosage forms at concentration levels ranging from about 0.5% to about 95% by weight of the total composition, i.e., in amounts which are sufficient to provide the desired unit dosage. A proposed daily dose of an active compound of this invention in the combination formulation (a formulation containing an active compound of this invention and a histamine H-i antagonist) for oral, parenteral, rectal or buccal administration to the average adult human for the treatment of the conditions referred to above is from about 0.01 mg to about 2000 mg, preferably from about 0.1 mg to about 200 mg of the active ingredient of formula I per unit dose which could be administered, for example, 1 to 4 times per day. 2000 mg, preferably from about 1 mg to about 200 mg of the histamine H1 antagonist per unit dose which could be administered, for example, 1 to 4 times per day. 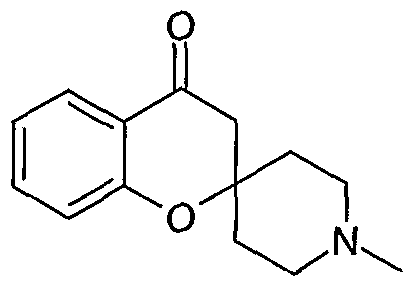 A preferred dose ratio of cetirizine to an active compound of this invention in the combination formulation for oral, parenteral or buccal administration to the average adult human for the treatment of the conditions referred to above is from about 0.00005 to about 20,000, preferably from about 0.25 to about 2,000. Aerosol combination formulations for treatment of the conditions referred to above in the average adult human are preferably arranged so that each metered dose or "puff' of aerosol contains from about 0.01 μg to about 100 mg of the active compound of this invention, preferably from about 1 μg to about 10 mg of such compound. Administration may be several times daily, for example 2, 3, 4 or 8 times, giving for example, 1 , 2 or 3 doses each time. Aerosol formulations for treatment of the conditions referred to above in the average adult human are preferably arranged so that each metered dose or "puff' of aerosol contains from about 0.01 mg to about 2000 mg of a histamine H1 antagonist, preferably cetirizine, preferably from about 1 mg to about 200 mg of cetirizine. Administration may be several times daily, for example 2, 3, 4 or 8 times, giving for example, 1, 2 or 3 doses each time. As previously indicated, a histamine H1 antagonist, preferably cetirizine, in combination with compounds of formula I are readily adapted to therapeutic use as antiallergy agents. In general, these antiallergy compositions containing a histamine H1 antagonist, preferably cetirizine, and a compound of formula I are normally administered in dosages ranging from about 0.01 mg to about 100 mg per kg of body weight per day of a histamine H1 antagonist, preferably cetirizine, preferably from about 0.1 mg. to about 10 mg per kg of body weight per day of cetirizine; with from about 0.001 mg. to about 100 mg per kg of body weight per day of a compound of formula I, preferably from about 0.01 mg to about 10 mg per kg of body weight per day of a compound of formula I, although variations will necessarily occur depending upon the conditions of the subject being treated and the particular route of administration chosen. In connection with the use of an active compound of this invention with a 5-HT reuptake inhibitor, preferably sertraline, for the treatment of subjects possessing any of the above conditions, it is to be noted that these compounds may be administered either alone or in combination with pharmaceutically acceptable carriers by either of the routes previously indicated, and that such administration can be carried out in both single and multiple dosages. More particularly, the active combination can be administered in a wide variety of different dosage forms, i.e., they may be combined with various pharmaceutically-acceptable inert carriers in the form of tablets, capsules, lozenges, troches, hard candies, powders, sprays, aqueous suspension, injectable solutions, elixirs, syrups, and the like. Such carriers include solid diluents or fillers, sterile aqueous media and various non-toxic organic solvents, etc. Moreover, such oral pharmaceutical formulations can be suitably sweetened and/or flavored by means of various agents of the type commonly employed for such purposes. In general, the compounds of formula I are present in such dosage forms at concentration levels ranging from about 0.5% to about 95% by weight of the total composition, i.e., in amounts which are sufficient to provide the desired unit dosage and a 5-HT re-uptake inhibitor, preferably sertraline, is present in such dosage forms at concentration levels ranging from about 0.5% to about 95% by weight of the total composition, i.e., in amounts which are sufficient to provide the desired unit dosage. A proposed daily dose of an active compound of this invention in the combination formulation (a formulation containing an active compound of this invention and a 5-HT reuptake inhibitor) for oral, parenteral, rectal or buccal administration to the average adult human for the treatment of the conditions referred to above is from about 0.01 mg to about 2000 mg, preferably from about 0.1 mg to about 200 mg of the active ingredient of formula I per unit dose which could be administered, for example, 1 to 4 times per day. A proposed daily dose of a 5-HT re-uptake inhibitor, preferably sertraline, in the combination formulation for oral, parenteral or buccal administration to the average adult human for the treatment of the conditions referred to above is from about 0.1 mg to about 2000 mg, preferably from about 1 mg to about 200 mg of the 5-HT re-uptake inhibitor per unit dose which could be administered, for example, 1 to 4 times per day. A preferred dose ratio of sertraline to an active compound of this invention in the combination formulation for oral, parenteral or buccal administration to the average adult human for the treatment of the conditions referred to above is from about 0.00005 to about 20,000, preferably from about 0.25 to about 2,000. Aerosol combination formulations for treatment of the conditions referred to above in the average adult human are preferably arranged so that each metered dose or "puff' of aerosol contains from about 0.01 μg to about 100 mg of the active compound of this invention, preferably from about 1 μg to about 10 mg of such compound. Administration may be several times daily, for example 2, 3, 4 or 8 times, giving for example, 1 , 2 or 3 doses each time. Aerosol formulations for treatment of the conditions referred to above in the average adult human are preferably arranged so that each metered dose or "puff' of aerosol contains from about 0.01 mg to about 2000 mg of a 5-HT re-uptake inhibitor, preferably sertraline, preferably from about 1 mg to about 200 mg of sertraline. Administration may be several times daily, for example 2, 3, 4 or 8 times, giving for example, 1 , 2 or 3 doses each time. As previously indicated, a 5-HT re-uptake inhibitor, preferably sertraline, in combination with compounds of formula I are readily adapted to therapeutic use as antidepressant agents. In general, these antidepressant compositions containing a 5-HT reuptake inhibitor, preferably sertraline, and a compound of formula I are normally administered in dosages ranging from about 0.01 mg to about 100 mg per kg of body weight per day of a 5-HT re-uptake inhibitor, preferably sertraline, preferably from about 0.1 mg. to about 10 mg per kg of body weight per day of sertraline; with from about 0.001 mg. to about 100 mg per kg of body weight per day of a compound of formula 1, preferably from about 0.01 mg to about 10 mg per kg of body weight per day of a compound of formula I, although variations will necessarily occur depending upon the conditions of the subject being treated and the particular route of administration chosen. Anxiety disorders include, for example, generalized anxiety disorder, panic disorder, PTSD, and social anxiety disorder. Mood adjustment disorders include, for example, depressed mood, mixed anxiety and depressed mood, disturbance of conduct, and mixed disturbance of conduct and depressed mood. Attention adjustment disorders include, for example, in addition to ADHD, attention deficit disorders or other cognitive disorders due to general medical conditions. Psychotic disorders include, for example, schizoaffective disorders and schizophrenia; sleep disorders include, for example, narcolepsy and enuresis. Examples of the disorders or conditions which may be treated by the compound, composition and method of this invention are also as follows: depression, including, for example, depression in cancer patients, depression in Parkinson's patients, post-myocardial Infarction depression, depression in patients with human immunodeficiency virus (HIV)1 Subsyndromal Symptomatic depression, depression in infertile women, pediatric depression, major depression, single episode depression, recurrent depression, child abuse induced depression, post partum depression, DSM-IV major depression, treatment-refractory major depression, severe depression, psychotic depression, post-stroke depression, neuropathic pain, manic depressive illness, including manic depressive illness with mixed episodes and manic depressive illness with depressive episodes, seasonal affective disorder, bipolar depression BP I, bipolar depression BP II, or major depression with dysthymia; dysthymia; phobias, including, for example, agoraphobia, social phobia or simple phobias; eating disorders, including, for example, anorexia nervosa or bulimia nervosa; chemical dependencies, including, for example, addictions to alcohol, cocaine, amphetamine and other psychostimulants, morphine, heroin and other opioid agonists, phenobarbital and other barbiturates, nicotine, diazepam, benzodiazepines and other psychoactive substances; Parkinson's diseases, including, for example, dementia in Parkinson's disease, neuroleptic- induced parkinsonism or tardive dyskinesias; headache, including, for example, headache associated with vascular disorders; withdrawal syndrome; age-associated learning and mental disorders; apathy; bipolar disorder; chronic fatigue syndrome; chronic or acute stress; conduct disorder; cyclothymic disorder; somatoform disorders such as somatization disorder, conversion disorder, pain disorder, hypochondriasis, body dysmorphic disorder, undifferentiated disorder, and somatoform NOS; incontinence; inhalation disorders; intoxication disorders; mania; oppositional defiant disorder; peripheral neuropathy; post- traumatic stress disorder; late luteal phase dysphoric disorder; specific developmental disorders; SSRl "poop out" syndrome, or a patient's failure to maintain a satisfactory response to SSRI therapy after an initial period of satisfactory response; and tic disorders including Tourette's disease. As an example, the mammal in need of the treatment or prevention may be a human. As another example, the mammal in need of the treatment or prevention may be a mammal other than a human. A compound of formula I, which is basic in nature, is capable of forming a wide variety of different salts with various inorganic and organic acids. The acid addition salts are readily prepared by treating the base compounds with a substantially equivalent amount of the chosen mineral or organic acid in an aqueous solvent medium or in a suitable organic solvent such as methanol or ethanol. Upon careful evaporation of the solvent, the desired solid salt is obtained. (D): (B) wherein n is one and R3 and R4 are both hydrogen; or R3 is methyl and R4 is hydrogen. The most preferred embodiment of the present invention includes the compounds of formula I in which R1 and R2 together with the nitrogen to which they are attached form a piperidine ring, R3, R4 and R5 are hydrogen, R6 is phenyl, k=0, m=3 and n=1. 1'-ethyl-6-(pyrrolidin-1-ylmethyl)-3,4-dihydrospiro[chromene-2,4'-piperidine]; 1I-ethyl-6-(morpholin-1-ylmethyl) 3,4-dihydrospiro[chromene-2,4'-piperidine]; δ-φyrrolidin-i-ylmethylJ-S^-dihydrospirotchromene^'-piperidine]; 1 '-methyl-6-(morpholin-1 -ylmethyl) 3,4-dihydrospiro[chromene-2,4'-piperidine]; and I'-methyl-δ-Cpyrrolidin-i-ylmethyO S^-dihydrospirofchromene^^'-piperidine]. Detailed Description of the Invention The compounds of formula I according to the invention may be prepared by the general procedure shown in Schemes 1 and 2. Thus, a carboxylic acid of general formula IV (Y=COOH, as described in WO- 2000/003681), can be converted to a carboxamide of general formula IV wherein Y = CONR1R2 using methods know to one skilled in the art. Such processes include, e.g., a.) conversion of the carboxylic acid to its carboxylic acid chloride using reagents such as thionyl chloride or oxalyl chloride, in a reaction inert solvent like methylene chloride or chloroform, followed by reaction with an amine of general formula HNR1R2, b.) conversion of the acid to a carboxylic acid anhydride or mixed anhydride, followed by reaction of said anhydride with an amine of general formula HNR1R2 as above, c.) activation of the acid with a reagent like dicyclohexylcarbodiimide (DCI), followed by reaction of the activated intermediate with an amine of general formula HNR1R2. Methods for effecting this conversion are widely disclosed in the chemical literature. The foregoing compounds of general formula IV can be converted to the intermediates of general formula V using reducing agents selective for the reduction of the carbonyl (C=O) group alone (i.e., V, Y = CONR1R2), or in addition to reducing the amide carbonyl (i.e., V, Y=CH2NR1R2). For example, treatment of the compounds of general formula IV with a reagent like NaBH4 in methanol or ethanol will reduce the carbonyl group to a CH(OH) group but leave the amide carbonyl intact, whereas treatment with LiAlH4 in a solvent like THF or diethyl ether is generally employed to simultaneously reduce the carbonyl to an alcohol and the carboxamide to the corresponding alkylamine. Compounds of general formula V may then be converted to the intermediates of general formula Vl via the elimination of water to form a carbon-carbon double bond (i.e., C=C). This transformation can be effected in a number of different processes that are well known to one skilled in the art of organic chemistry. For example, efficient methods for this conversion include, among many others: a.) heating the alcohol of general formula V with a strong acid like hydrochloric acid, or an organic acid like p-toluenesulfonic acid, in an inert solvent in an apparatus designed to remove the water formed; b.) heating the compound V in a solvent like benzene or toluene in the presence of activated molecular sieves or in an apparatus designed to remove the solvent-water azeotrope. The compounds of general formula Vl so prepared can then be converted to the compounds of general formula I via hydrogenation of the C=C bond. This transformation can be achieved using catalytic reduction conditions, e.g., treatment of Vl in a reaction inert solvent with hydrogen gas (H2) in the presence of a catalyst (e.g., Pt, Pd, Rh) and in the presence or absence of an equivalent amount of a mineral acid, such as HCI, HBr or HI. Compounds of general formula IV (Y=H), prepared in the same manner as for compounds of formula IV in Scheme I, can be reduced to the corresponding alcohols of general formula V using reagents and conditions as described for converting IV to V according to Scheme I. The intermediate alcohols of formula V can then be dehydrated to the intermediates of formula Vl, as described for the conversion of V to Vl in Scheme I, and subsequently converted to the compounds of general formula VII according to the method described for the conversion of Vl to I. To obtain compounds of general formula I wherein R4 is not hydrogen, it is also possible to convert an intermediate of general formula IV to an intermediate of general formula Vl. A number of general methods and reagents are available to effect such a conversion including, for example, the reaction of an intermediate of formula IV with a Grignard reagent of general formula R4MgB, wherein R4 is as defined previously and B is a halogen, e.g., bromine, followed by elimination of water to form the carbon-carbon double bond in Vl. Alternatively, the intermediate IV may be reacted with an alkyl lithium reagent of general formula R4Li, followed by dehydration of the tertiary alcohol to create the unsaturated intermediate of formula Vl. Compounds of general formula VII can then be converted to the intermediates of general formula VIII by adapting methods disclosed in the chemical literature for the syntheses of aryl aldehydes and ketones. For example, compounds of formula VII may be treated with a reagent such as dichloromethyl methyl ether (i.e., CI2CHOCH3) to produce an aldehyde of the general formula VIII wherein Y = CHO (i.e., R3 = H). When R3 is not hydrogen (e.g., C1-C6 alkyl), the intermediate of formula VIII may be prepared using e.g., Friedel-Crafts conditions, such as R3COCI and a Lewis acid such as AICI3, SnCI2 or BF3 as a catalyst in a reaction inert solvent like chloroform or carbon disulfide. The imine may then be isolated or further reduced to the product of general formula I in situ with a reagent like sodium borohydride, lithium borohydride, sodium triacetoxyborohydride or sodium cyanoborohydride in a solvent like methanol or ethanol at a temperature of about -200C to about 5O0C; preferably this conversion is done using sodium borohydride in methanol at room temperature. Solvents were purchased and used without purification. Yields were calculated for material judged homogenous by thin layer chromatography and NMR. Thin layer chromatography was performed on Merck Kieselgel 60 F 254 plates eluting with the solvents indicated, visualized by a 254 nm UV lamp, and stained with either an aqueous KMnO4 solution or an ethanolic solution of 12-molybdophosphoric acid. Flash column chromatography was performed with using either pre-packed Biotage® or ISCO columns using the size indicated. Nuclear magnetic resonance (NMR) spectra were acquired on a Unity 400 or 500 at 400 MHz or 500 MHz for 1H, respectively, and 100 MHz or 125 MHz for 13C NMR, respectively. Chemical shifts for proton 1H NMR spectra are reported in parts per million relative to the singlet of CDCI3 at 7.24 ppm. Chemical shifts for 13C NMR spectra are reported in parts per million downfield relative to the centerline of the triplet of CDCI3 at 77.0 ppm. Mass spectra analyses were performed on a APCI Gilson 215, micromass ZMD (50% Acetonitrile / 50% water) spectrometer. Method A: Preparative conditions (Waters 600 & Waters 2767 Sample Manager); Column: Waters Symmetry C18, 5μm, 30 x 150 mm steel column, part # WAT248000, serial # M12921A01 ; solvent A - 0.1% Trifluoroacetic acid/water; solvent B - Acetonitrile; volume of injection: 850 μL; time 0.0, 100% solvent A, 0% solvent B, flow 20; time 2.0, 100% solvent A, 0% solvent B, flow 20; time 12.0, 0% solvent A, 100% solvent B, flow 20; time 15.0, 0% solvent A, 100% solvent B, flow 20; time 15.1 , 100% solvent A, 0% solvent B, flow 20; time 20.0, 100% solvent A, 0% solvent B, flow 20. Mass spectral (micromassZO) conditions; Capillary(kV): 3.0; Cone (V): 20; Extractor (V): 3.0; RF Lens (V): 0.5; Source temp. (0C): 120; Desolvation temp. (0C): 360; Desolvation gas flow (L/hr): 450; Cone gas flow (L/hr): 150; LM Resolution: 15; HM Resolution: 15; Ion Energy: 0.2; Multiplier: 550. Acetonitrile; volume of injection: 1050 μL; time 0.0, 100% solvent A, 0% solvent B, flow 20; time 2.0, 100% solvent A, 0% solvent B, flow 20; time 12.0, 0% solvent A, 100% solvent B, flow 20; time 14.0, 0% solvent A, 100% solvent B, flow 20; time 14.1 , 100% solvent A, 0% solvent B, flow 20; time 19.1 , 100% solvent A, 0% solvent B, flow 20. Splitter; Acurate by LC Packings, 1/10,000; Upchurch needle valve setting: 14; Make up pump (Waters 515) Flow (ml/min. ): 1. PDA (Waters 996) Settings; Start/End wavelength (nm): 200/600; Resolution: 1.2; Sample Rate: 1; Channels: TIC, 254 nm and 220 nm. 100% solvent B, flow 20; time 12.0, 0% solvent A, 100% solvent B, flow 20. Start/End wavelength (nm): 200/600; Resolution: 1.2; Sample Rate: 1 ; Channels: TIC1 254 nm and 220 nm. A mixture of 3-acetyl-4-hydroxybenzoic acid (5.0 g, 27.2 mmol) and t-butyl-4-oxo- piperidinecarboxylate (5.52 g, 27.7 mmol) in methanol (20OmL) was treated at rt with pyrrolidine (2.42 g, 2.4 ml_, 27.7 mmol) to give a thick yellow slurry. After stirring for 48 hr at rt, the brown mixture was concentrated in vacuo to a pasty brown sludge. Addition of Et2O with stirring formed yellow crystals that tended to gum on standing. This material was used without further purification in the formation of the corresponding amide, Intermediate 2-1. 1'-acetyl-4-oxo-3,4-dihvdrospiro[chromene-2.4'-piperidine1-6-carboxylic acid. 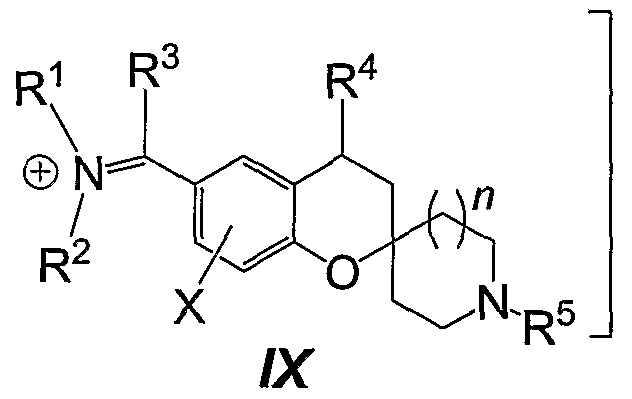 This was prepared in the same manner as described for intermediate 1-1 above, replacing t-butyl-4-oxo-piperidinecarboxylate with N-acetyl-4-piperidone. A mixture of 1'-(tert-butoxycarbonyl)-4-oxo-3,4-dihydrospiro[chromene-2,4'- piperidine]-6-carboxylic acid ( 27.1 mmol, intermediate 1-1), pyrrolidine (1.93 g, 27.1 mmol, 2.3 mL), 80 ml_ DMF and 40 mL 1 ,2-dichloroethane were stirred under N2 and treated with triethylamine (5.47 g, 54 mmol, 7.55 mL) followed by O-(benzotriazol-1-yl)-N,N,N',N'- tetramethyluronium hexafluorophosphate (15.0 g, 40.7 mmol, HBTU). The dark solution was stirred at rt overnight, then diluted with 1 N NaOH and stirred 45 min. EtOAc and water were added, the organic layer was separated and combined with additional EtOAc extractions of the aqueous layer. The combined organic layers were washed with water and saturated NaCI, dried over MgSO4, filtered and concentrated in vacuo to a brown oil, 10.04 g. This material was chromatographed on silica gel (Biotage, 150 x 40 mm) eluting with 2:1 EtOAc- hexanes containing 1% TEA to remove the less polar impurities, then increasing the polarity to EtOAc-1% TEA to elute the product. Product fractions were combined and concentrated in vacuo to a yellow foam, 2.48 g.
CH2CI2 was heated to reflux under N2 for 5 hr, stirred overnight at rt, and reheated to reflux for an 1 hr. An additional 0.8 mL thionyl chloride was added and the mixture again refluxed for 2 hr. After cooling to rt, the reaction was evaporated in vacuo to a brown solid. The solid in 40 mL CH2CI2 was treated with morpholine (1.29 g, 1.30 mL, 14.9 mol) dissolved in 5 mL CH2CI2. After stirring for 3 hr at rt, the mixture was diluted with additional CH2CI2 and saturated aqueous NaHCO3, the organic layer was separated and washed with water and saturated NaCI, and the organic layer was dried with MgSO4. Removal of the solvent in vacuo gave a light orange foam, 1.97 g.
Mass spectrum (m/z): calculated for C20H24N2O5: 372.42. Found: 373 (M+1). I'-acetyl-e-fpyrrolidin^-ylcarbonvD-spirofchromene-ΣΛ'-piperidini^OHVone. This was prepared in the same manner as described above, beginning with 1'-acetyl- 4-oxo-3,4-dihydrospiro[chromene-2,4'-piperidine]-6-carboxylic acid (3.0 g, 9.0 mmol, intermediate 1-2), to give the product as a yellow tacky foam, 1.55 g. Mass spectrum (m/z): calculated for C20H24N2O4: 356.43. Found: 357 (M+1). A solution of 1'-(1 ,1-dimethyl-ethoxycarbonyl)-6-(morpholin-4-ylcarbonyl)-spiro[chro- mene-2,4'-piperidin]-4(3H)-one in (0.535 g, 1.29 mmol, intermediate 2-1) in THF (25 mL) was cooled to 0 °C and treated with a solution of 1.0 M LAH in THF (7.8 mL, 7.8 mmol) to produce a light tan solution. After 20 hr at rt, the reaction was quenched with water (0.30 mL), 15% NaOH (0.30 mL) and water (0.90 mL). A small amount of MgSO4 was added and after filtration the solvent was removed in vacuo to leave a clear oil, 0.314 g. Chromatography on silica gel (Biotage) eluting with 15% CH3OH in CHCI3 gave a clear oil, 0.109 g. Mass spectrum (m/z): calculated for C19H2SN2O2: 316.37. Found: 317 (M+1). I'-ethyl-θ-fpyrrolidin-i-ylmethvD-SΛ-dihvdrospirorchromene^^'-piperidini^-ol. 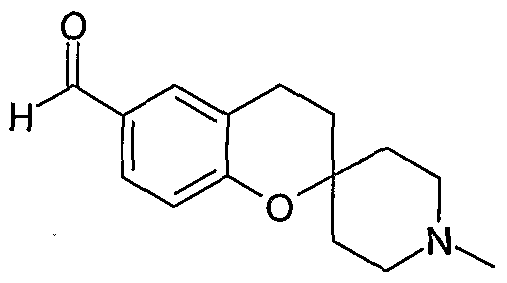 This was prepared as in intermediate 3-2 above, beginning with 1 '-acetyl-6- (pyrrolidin-4-ylcarbonyl)-spiro[chromene-2,4'-piperidin]-4(3H)-one (0.39 g, 1.1 mmol, intermediate 2-2) and 6.6 mL of 1.0 M LAH in THF, to give the product as a clear, colorless oil, 0.199 g.
Mass spectrum (m/z): calculated for C20H30N2O2: 330.38. Found: 331 (M+1). I'-di-dimethyl-ethoxycarbonvπ-δ-fpyrrolidin^-ylmethvD-spirofchromene^Λ'- piperidinl-4-ol. 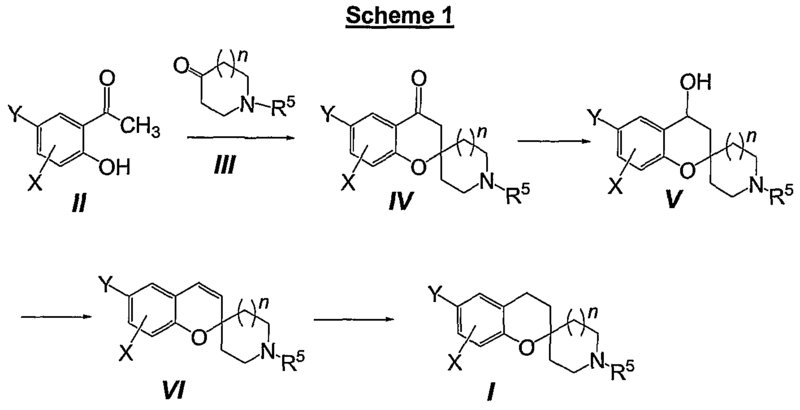 Under N2, a solution of 1'-(1 ,1-dimethyl-ethoxycarbonyl)-6-(morpholin-4-ylcarbonyl)- spiro[chromene-2,4'-piperidin]-4(3H)-one (0.802 g, 1.94 mmol, intermediate 2-1) in 40 mL THF was cooled to 5 0C and stirred while adding LAH (7.7 mL, 7.7 mmol, 1.0 M LAH in THF). After stirring for 2 hr at 0 0C, the reaction was diluted with THF (15 mL) and quenched by adding water (0.80 mL). After warming to rt, the mixture was filtered through a d.e. pad, the pad was washed with EtOAc and the organic filtrates were concentrated in vacuo to a white foam, 0.606 g.
1'-methyl-6-(pyrrolidin-1-yl)-spirorchromene-2,4'-piperidinel. A solution of r-methyl-6-(pyrrolidin-1-ylmethyl)-3,4-dihydrospiro[chromene-2,4'- piperidin]-4-ol (0.10 g, 0.32 mmol, intermediate 3-1) in toluene (50 mL) containing p- toluensulfonic acid (0.126 g, 0.664 mmol) was refluxed with a Dean-Stark trap to collect the azeotroped water. After 18 hr, the reaction was cooled to rt and partitioned the residue with EtOAc and saturated aqueous NaHCO3. The aqueous layer was re-extracted with EtOAc and the combined organic layers were washed with water and saturated NaCI, filtered and concentrated in vacuo to a pale film, 0.065 g.
Mass spectrum (m/z): calculated for C19H26N2O: 298.34. Found: 299 (M+1). 1 H-nmr (CDCI3, 400 MHz) δ 1.74 (m, 6H), 1.98, (s, 1 H), 2.01 (s, 1H), 2.30 (s, 3H), 2.46 (m, 6H), 2.54 (m, 2H), 3.47 (s, 2H), 5.53 (d, 1H), 6.33 (d, 1 H), 6.74 (d, 1 H), 6.93 (s, 1 H), 7.01 (dd, 1 H). 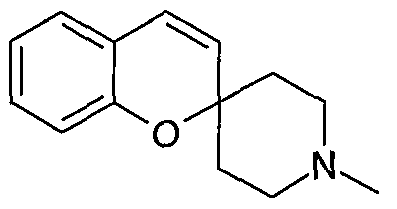 A solution of 1'-ethyl-6-(morpholin-1-ylnnethyl)-3,4-dihyclrospiro[chromene-2,41- piperidin]-4-ol (0.785 g, 2.25 mmol, intermediate 3-2) and p-toluenesulfonic acid (10 mg) in toluene (150 mL) in a 50 mL round-bottom flask fitted with a Dean-Stark trap and condenser was heated to reflux under N2 for 24 hr. After cooling to rt, the solvent was removed in vacuo to a brown solid that was dissolved in EtOAc, washed with water, saturated Na2CO3 and saturated NaCI. The organic layer was dried with MgSO4, filtered and concentrated to a tan solid, 0.412 g. This material was used without further purification in Example 2. This was prepared in the same manner as above, beginning with 1 '-ethyl-6- (pyrrolidin-1-ylmethyl)-3,4-dihydrospiro[chromene-2,4'-piperidin]-4-ol (0.19 g, 0.58 mmol, intermediate 3-3) to give a yellow solid, 0.135 g. M.p. 269.6-270.6 0C. Mass spectrum calculated for C20H28N2O: 312.46. Found: 313 (M+1). 1 H-nmr (CDCI3, 400 MHz) δ 1.34 (bs, 1 H), 1.98 (m, 6H), 2.14 (bs, 3H), 2.26 (m, 2H), 3.13 (bs, 2H), 3.46 (bs, 4H), 4.26 (bs, 2H), 5.73 (d, 1H), 6.57 (d, 1H), 7.01 (d, 1 H), 7.28 (bs, 1 H), 7.36 (d, 1H). Under N2, a solution of o-hydroxyacetophenone (3.4 g, 25.0 mmol, Aldrich) in 100 mL of methanol was treated with N-methyl-4-piperidone (2.83 g, 25.0 mmol, Aldrich) followed by pyrrolidine (2.18 g, 2.2 mL, 25.0 mmol). The solution was stirred at rt for 18 hr and the solvents then removed under reduced pressure to give a clear amber oil. The oil was dissolve in EtOAc, washed with saturated NaCI and dried over MgSO4. Concentration in vacuo gave an amber colored oil, which was chromatographed using a Biotage silica gel column eluted with CHCI3, followed by 5% CH3OH in CHCI3. The product was isolated as an oil, 7.8 g.
Mass spectrum (m/z): 232 (M+1). 2H), 2.26 (s, 3H), 1.99 (d, 2H), 1.69 (t, 2H). 21.4 mmol, intermediate 7) in 100 mL of 0.5M HCI and 40 mL ethanol. This mixture was hydrogenated on a Parr shaker apparatus at 45 psi H2 at rt for 18 h. The mixture was then filtered through a pad of d.e., the pad washed with additional ethanol and with water, and the filtrates combined and evaporated in vacuo. The resulting oil was partitioned with EtOAc - dilute aqueous Na2CO3, the aqueous layer extracted with additional EtOAc and the organics combined and washed with water and saturated NaCI. After drying over MgSO4, the solvents were removed in vacuo to give an oil, 3.04 g.
Mass spectrum (m/z): calculated for C14H22NO: 217.31. Found: 218 (M+1). 1 H-nmr (400 MHz, CDCI3) δ 7.08 (m, 1 H), 7.02 (m, 1 H), 6.82 (m, 2H), 2.75 (dt, 2H), 2.60 (m, 2H), 2.42 (dt, 2H), 2.32 (s, 3H), 1.78 (m, 4H), 1.66 (m, 2H). r-ethyl-θ-fpyrrolidin-i-ylmethvD-SΛ-dihvdrospirofchromene^Λ'-piperidine'l. A mixture of 1'-ethyl-6-(pyrrolidin-1-ylmethyl)-spiro[chromene-2,4'-piperidine] (0.3 mmol, intermediate 4-3 ) and 10% palladium-on-carbon (100 mg, 50% water wet) in water (20 mL) and ethanol (5.0 ml.) in a Parr pressure bottle was treated with 1.0 mL of 2.0 M HCI and hydrogenated at 45 psi for 24 hr. The catalyst was removed by filtration through a diatomaceous earth (d.e.) filter, the filter cake was washed with additional ethanol and water, and the filtrates were combined and concentrated in vacuo to a waxy residue. Trituration with acetone produced a light yellow solid, 85 mg, m.p. 301.2-302.5 0C. Mass spectrum (m/z) calcd for C20H30N2O: 314.47; obsd. 315 (M+1). 1H-nmr (DMSOd6, 400 MHz) δ 1.23 ( t, 3H), 1.88 (m, 8H), 2.72 (bs, 2H), 3.00 (m, 5H), 3.24 (bs, 2H), 3.34 (bm, 5H), 4.14 (d, 2H), 6.83 (d, 1 H), 7.30 (bs, 1 H), 7.32 (d, 1 H). A mixture of 1'-ethyl-6-(morphoiin-1-ylmethyl)-spiro[chromene-2,4'-piperidine] (0.412 g, 1.25 mmol, intermediate 4-2) in 20 mL ethanol and 40 mL H2O was combined with 400 mg of 10% palladium-on-carbon (50% water wet) followed by 1.0 N HCI (10 mL) in a Parr pressure bottle (500 mL). The mixture was hydrogenated at 45 psi for 22 hr at room temperature, filtered, recharged with fresh Pd catalyst (200 mg) and hydrogenated at 45 psi for another 24 hr. After filtering through a pad of diatomaceous earth and washing the filter pad with water and ethanol, the filtrate was made basic to pH 12 with 2N NaOH. The filtrate was extracted with CH2CI2, the extracts were combined and washed with water and saturated NaCI and after drying with MgSO4 the solvent was removed in vacuo to a cloudy oil. The oil was chromatographed on silica gel (Biotage, 12 x 70 mm column) eluting with chloroform. The product was isolated as a waxy solid, 56 mg, which was dissolved in ethyl acetate and treated with 1.0 M HCI in diethyl ether to give the HCI salt as a white solid, 41 mg, m.p. 321.7- 323 0C. Mass spectrum (m/z) calcd. for C20H30N2O2: 330.46; obsd. 331 (M+1). 1H-nmr (CDCI3, 400 MHz) δ 1.22 ( t, 3H), 1.77 (t, 2H)1 1.89 (t, 2H), 1.90 (m, 3H), 2.72 (m, 2H), 3.04 (m, 8H), 3.34 (bs, 1 H), 3.73 (t, 2H), 3.87 (d, 2H), 4.14 (d, 2H), 6.84 (d, 1 H), 7.30 (m, 2H). A solution of 1'-(1 ,1-dimethyl-ethoxycarbonyl)-6-(pyrrolidin-4-ylmethyl)-spiro- [chromene-2,4'-piperi-din]-4-ol (0.60 g, 1.49 mmol, intermediate 3-4) and concentrated HCI (2.0 mL) in isopropanol (5.0 mL) was heated to reflux with stirring for 2 hr, cooled to rt and concentrated in vacuo to a brown oil, 0.552 g. The oil was dissolved in 20 mL ethanol and 40 mL water, treated with 1 N HCI (10 mL) and added to 10 % Pd-on-carbon catalyst (0.25 g) in a 250 mL Parr shaker bottle under a N2 atmosphere. The reactants were hydrogenated at 40 psi of hydrogen for approximately 2 hr. The contents were filtered through a pad of d.e., the filter cake was washed with additional ethanol and water, and the solvents were removed in vacuo to a green-yellow glass. Trituration with EtOAc gave a yellow crystalline solid, 0.360 g, m.p. 280.4-282.5 °C. 1H-nmr (DMSOd6, 400 MHz) δ 1.79 (bm, 8H), 1.94 (bs, 2H), 2.70 (m, 2H), 3.00 (bm, 4H), 3.14 (bm, 2H), 3.24 (bm, 2H), 4.14 (d, 2H), 6.84 (d, 1 H), 7.29 (d, 2H), 9.11-9.19 (bs, 2H, HCI), 10.91 (bs, 1 H, NH). 1 '-methyl-6-(morpholin-1 -ylmethyP 3,4-dihydro-spirorchromene-2.4'-piperidinel Under N2, a solution of 1'-methyl-3,4-dihydrospiro[chromene-2,4'-piperidine]-6- carboxaldehyde (0.201 g, 0.82 mmol, Intermediate 9) in methanol (20 mL) was stirred at rt while titanium isopropoxide (0.466 g, 0.49 mL, 1.6 mmol) was added via pipette. Morpholine (0.139 g, 0.14 mL, 1.6 mmol) was added and stirring continued for 18 hr, after which sodium borohydride (0.46 g, 1.23 mmol) was added. After 24 hr at rt, the reaction was quenched with water (10 mL), EtOAc (30 mL) and 1.0 N HCI (2.0 mL). After stirring for 15 min, this was filtered through a pad of diatomaceous earth, washing the pad with additional EtOAc and water. The organic layer was separated, the aqueous layer was extracted with additional quantities of EtOAc, the organic layers were combined and washed with water and saturated NaCI, and the organics were dried with MgSO4 and filtered. Removal of the solvent in vacuo gave a clear, colorless oil, 0.177 g. The oil was chromatographed on silica gel (Biotage, 12 x 70 mm) eluting with 5% methanol in chloroform to give purified product as a clear oil, 0.078 g. The oil was dissolved in EtOAc and treated with 0.5 mL of 1.0 M HCI in diethyl ether, stirred for 4 hr to give a granular solid which was filtered, washed with EtOAc and dried to a white solid, 0.059 g, m.p. 294.5-295.1 0C. I'-methyl-e-fpyrrolidin-i-ylmethvπ-S^-dihvdro-spirorchromene^.^-piperidinel. 1'-methyl-6-(pyrrolidin-1-ylmethyl)-spiro[chromene-2,4'-piperidine] (61 mg, 0.16 mol, Intermediate 4-1) and 10% Pd-on-carbon (10 mg) in 10 mL ethanol and 10 mL water containing 6N HC! (1.0 mL) was hydrogenated on a Parr Shaker apparatus at 45 psi for 2 hr. The reaction mixture was filtered through a pad of d.e., the filter cake washed with water and ethanol, and the solvents removed in vacuo to a clear film, 0.65 mg. Mass spectrum (m/z) calcd. for C19H28N2O: 300.44; obsd. 301 (M+1). Determination of Biological Activity The in vitro affinity of the compounds in the present invention at the rat or human histamine H3 receptors can be determined according to the following procedure. Frozen rat frontal brain or frozen human post-mortem frontal brain is homogenized in 20 volumes of cold 50 mM Tris»HCI containing 2 mM MgCI2 (pH to 7.4 at 4°C). The homogenate is then centrifuged at 45,000 G for 10 minutes. The supernatant is decanted and the membrane pellet re-suspended by Polytron in cold 50 mM Tris»HCI containing 2 mM MgCI2 (pH to 7.4 at 4 0C) and centrifuged again. The final pellet is re-suspended in 50 mM Tris HCI containing 2 mM MgCI2 (pH to 7.4 at 25 0C) at a concentration of 12 mg/mL. Dilutions of compounds are made in 10% DMSO / 50 mM Tris buffer (pH 7.4) (at 10 x final concentration, so that the final DMSO concentration is 1%). Incubations are initiated by the addition of membranes (200 microliters) to 96-well V-bottom polypropylene plates containing 25 microliters of drug dilutions and 25 microliters of radioligand (1 nM final concentration 3H-N-methylhistamine). After a 1-hour incubation, assay samples are rapidly filtered through Whatman GF/B filters and rinsed with ice-cold 50 mM Tris buffer (pH 7.4) using a Skatron cell harvester. Radioactivity is quantified using a BetaPlate scintillation counter. The percent inhibition of specific binding can then be determined for each dose of the compound, and an IC50 or Ki value can be calculated from these results. When tested using the above method, the compound of example 1 had a Ki value of 9.8 nM. R5 is selected from the group consisting of hydrogen, (CrC6)alkyl, (C0-C3)alkyl-aryl (optionally substituted), (C0-C3)alkyl-heteroaryl (optionally substituted); and n is 0, 1, 2 or 3. 2. The compound of Claim 1 , wherein R1 and R2 together with the nitrogen to which they are attached form a pyrrolidine ring. 3. The compound of Claim 1 , wherein R1 and R2 together with the nitrogen to which they are attached form a piperidine ring. 4. The compound of Claim 3, wherein n is one and R3 and R4 are both hydrogen. 5. The compound of Claim 3, wherein n is one and R3 is methyl and R4 is hydrogen. 6. The compound of Claim 2, wherein n is one and R3 and R4 are both hydrogen. 7. The compound of Claim 2, wherein n is one and R3 is methyl and R4 is hydrogen. 8. The compound of Claim 1 , wherein R1 and R2 together with the nitrogen to which they are attached form a piperidine ring, R3, R4 and R5 are hydrogen, R6 is phenyl, k is 0, m is 3 and n is one. 1 -methyl-6'-(pyrrolidin-1 -ylmethyl)-3',4'-dihydrospiro[azetidine-3,2'-chromene]; and [(I'.S-dimethyl-S.ΦdihydrospiroCchromene-Z.S'-pyrroiidinJ-β-yOmethylldimethylamine. 12. A pharmaceutical composition for treating a disorder or condition that may be treated by antagonizing histamine-3 receptors, the composition comprising a compound of formula I as described in Claim 1 , and optionally a pharmaceutically acceptable carrier. 13. A method of treatment of a disorder or condition that may be treated by antagonizing histamine-3 receptors, the method comprising administering to a mammal in need of such treatment a compound of formula I as described in Claim 1. 14. A pharmaceutical composition comprising a compound of formula I as described in claim 1 , and optionally a pharmaceutically acceptable carrier. 15. A method of treatment of a disorder or condition selected from the group consisting of depression, mood disorders, schizophrenia, anxiety disorders, Alzheimer's disease, attention-deficit hyperactivity disorder (ADHD), psychotic disorders, sleep disorders, obesity, dizziness, epilepsy, motion sickness, respiratory diseases, allergy, allergy- induced airway responses, allergic rhinitis, nasal congestion, allergic congestion, congestion, hypotension, cardiovascular disease, diseases of the Gl tract, hyper- and hypo- motility and acidic secretion of the gastro-intestinal tract, the method comprising administering to a mammal in need of such treatment a compound of formula I as described in Claim 1. 16. The method of Claim 17, wherein the disorder or condition is selected from the group consisting of anxiety disorders, attention-deficit hyperactivity disorder, respiratory diseases, and obesity. 17. The method of Claim 17, wherein the disorder or condition is a respiratory disease selected from the group consisting of adult respiratory distress syndrome, acute respiratory distress syndrome, bronchitis, chronic bronchitis, chronic obstructive pulmonary disease, cystic fibrosis, asthma, emphysema, rhinitis and chronic sinusitis. 19. A pharmaceutical composition for treating depression and mood disorder comprising: a) an H3 receptor antagonist or a pharmaceutically acceptable salt thereof; b) a neurotransmitter uptake blocker or c) a pharmaceutically acceptable salt thereof; wherein the active ingredients (a) and (b) above are present in amounts that render the composition effective in treating depression and mood disorder. 20. The composition according to Claim 19 wherein the H3 receptor antagonist and the neurotransmitter blocker are given simultaneously. 21. The composition according to Claim 18 wherein the H3 receptor antagonist and the H1 receptor antagonist are given simultaneously. 22. The pharmaceutical composition of Claim 19 wherein the neurotransmitter uptake blocker are selected from SSRI; sertraline, fluoxetine and paroxetine. 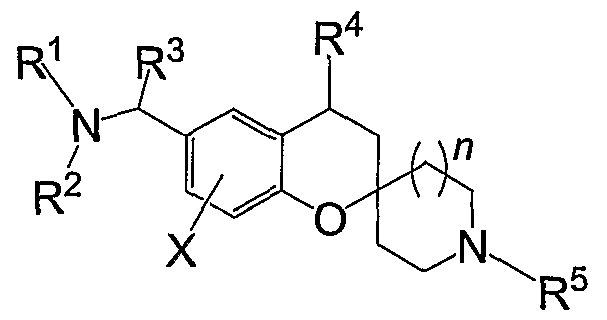 WO2013164730A1 (en) 2012-05-04 2013-11-07 Pfizer Inc. Heterocyclic substituted hexahydropyrano [3,4-d] [1,3] thiazin- 2 -amine compounds as inhibitors of app, bace1 and bace 2. ES2285227T3 (en) 2007-11-16 Arilbenzodiazepinas substituted piperazine. CN100586951C (en) 2010-02-03 Bi- and tricyclic substituted benzophenones as glycine transporter l(GlyT-1) inhibitors for the treatment of alzheimer&#39;s disease.